After a long 2 year wait, a 7 hour overnight plane ride, and a much delayed 2 hour flight to Inverness I was finally back in the Highlands. After claiming my “right up to the limits” baggage full of gear and gifts, I could see my brother and Frank sitting in the coffee shop awaiting my arrival. A quick load and off we went to the Snow Goose Inn Fish and Chips with a pint before heading north to Caithness. Arriving at the cottage we unloaded, got squared away, and passed out. Morning came much too early – especially since my body said it was still the middle of the night. We walked out the truck and noticed with great joy the trailer on the back contained an Argo Cat. Our destination was just over the shire (county) border into Sutherland, and as we got nearer the omens were good. We saw stags and hinds everywhere alongside the road . Crossing the bùrn (small creek) I looked across the clearcut to see a sika stag standing within the boundary of the area we were to hunt. Scott had Sika on his wish list, having only killed a spike on our previous trips. We made our plans and stalked into the wind. My brother went towards the clearcut while my friend and I dropped over the edge of the berm and down onto the margins of a very small creek. We had gotten about ½ mile along when we bumped a sika female. This turned out to be a blessing in disguise because we realized we were moving too fast. Less than 100 yards further along, our slow movement was rewarded. Not 200 yards away (later ranged at 171 yards) stood a majestic stag, looking directly toward us. With the strong wind in our face he could not scent us, and it was obvious his rut clouded brain had not identified us as danger. I seem to remember reading somewhere at some point that there was a minimum distance that you could hunt from a dwelling (with a firearm). I have done some searching but have been unable to locate any reference to it now. Is anyone aware of such a law or regulation? Does anyone have any info on West Kentucky WMA? My group got selected for December 15-18th. Never hunted it before just looking for any possible info that could help! cant have a feeder or a cam. Tear them up. My little man's youth buck. We were hunting here in Magoffin County on youth weekend and we were lucky enough to get a nice 7 point. Yesterday I saw 2 dead and 1 live buck on the highway in central ky .
post up what youve seen and round about location . Do you have any tips on how to hunt small game on public land during deer season and still be courteous? My fear is that I'll start rabbit hunting a field that someone has been overlooking in a stand since 5:00am, and I just can't see their stand. Rabbit hunting can be really noisy, and I can cover miles and miles when squirrel hunting. What, other than simply not hunting, can be done to enjoy public small game hunting while having no or minimal effects on big game hunters? What’s you guys favorite places to stay overnight when hunting in Fort Knox. Doesn’t have to be fancy just clean with bed and shower, thanks! Bow for my step daughter? What bow would you guys recommend for my 16 year old step daughter? She has never shot one before and wants to give it a try. I am afraid she won’t stick with it so don’t want to spend a fortune on one. There is a couple decent looking ones on Walmart.com but just not sure what to get. flint and chert near the Ohio river. I recently was lucky enough to be drawn for tags through the lottery for Sandhill Cranes this year. I've never hunted them before and was looking for tips on these guys, as well as any information where I can begin looking for WMA's or land to hunt. Any and all information is welcome. Thanks in advance! Mother in Law BIG BULL! Well when your 75yr old mother n law tells u she drew a Ky elk tag An she lives n Indiana u don’t even know what to say other than WOW! Congrats and kill a biggin! Well she did! ive got noaa weather radar but it’s raining right now but app shows it’s done past it’s not a hard rain but it’s enough I’m not going yet. Now if it’s spring turkey I will don’t care but any other time I’m not. Been several times this app has screwed me up. Lol What app do some of y’all have? Soon has it breaks I’m hittin the woods coyote huntin. Got this 9 pointer about 6pm this evening. Ran cameras here year round and this is the first time I have laid eyes on him. Figured I’d post here in this forum as it covers a broad range of hunting. Which I’ve been thinking hard about purchasing a good quality portable ground blind. Probably won’t bite the bullet on the purchase till after Christmas... unless I find a really good deal. My specific wants... hub style, good quality material & camo that’s wont fade out too quickly, fairly waterproof, room for 2, enough ceiling height to shoot a bow with adequate window height as well... but not necessarily needing surround view types. It’s not anything I’m going to leave out for months, maybe only a few days or maybe a week. Weight not too big a deal, probably throw on atv to transport most times. Probably be used for turkey hunting but may see use with deer on occasion. Price range ... up to $500. Most things I’ve read point toward a Double Bull but heard good things on the Rhino blinds as well. Just wondering if anyone has opinions on those or others that i may be overlooking. Open to any suggestions... including the good or bad. Everyone is invited to come out and meet with old and new friends and get to know a great organization dedicated to our public lands and waters. Backcountry Hunters and Anglers is just starting our Kentucky chapter and we are interested in hearing about the importance of your public lands and waters to you. Did anyone else see a monster Kentucky bull that was taken in the last couple days? I saw it last night on Facebook and it is huge. The hunter was guided by Lost Mountain outfitters. This big 11 pt was taken by one of my good friends son,Jordan. Guess I’ll put this in general hunting since that’s what I use it for. I rolled my ATV on its side about 3 weeks ago. No biggie. Some oil leaked out, not much at all. I checked it cold and all of my fluids look good. However, on Wednesday road it on a property we got access to and about the time I got it back to my trailer it said Engine Hot. I’m not a guru and don’t feel like giving up the big bucks to have it checked. I basically paid an arm and leg and had it overhauled in Fall of 15 so can’t be much wrong with it. Any idea what I should check? Would simple burn off on the engine cause this? I did run it in AWD Hi/Lo more than I usually do. It was pretty muddy. dove shoot at my place! A hunter is fighting for life after a bear he shot tumbled down a slope and landed on him. Alaska state police said William McCormick, 28, was also struck by a rock dislodged by the bear as it fell on Saturday afternoon. He was flown by helicopter to a hospital in Anchorage, where he was in a critical condition. Mr McCormick and his hunting partner, 19-year-old Zachary Tennyson, are both US army soldiers stationed at Alaska’s Joint Base Elmendorf-Richardson. Mr Tennyson was not hurt and alerted authorities by sending a distress signal. Police did not say what kind of bear was shot, how far how it fell, or whether it died. Alaska is home to several species of bear, including an estimated 30,000 brown bears and 100,000 smaller black bears. 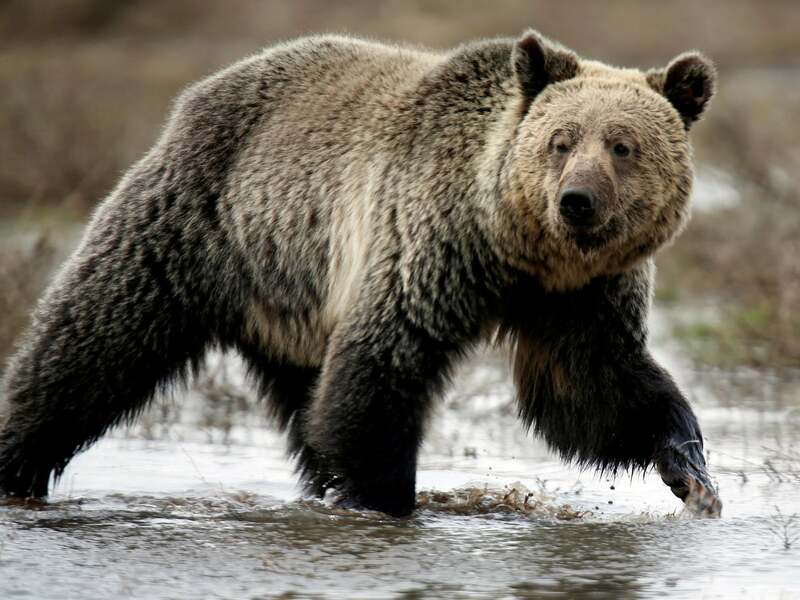 Nearly 1,500 brown bears are hunted each year in the state. This guy got ran over last night, I suppose in the driving rainstorm that overflowed my rain gauge. 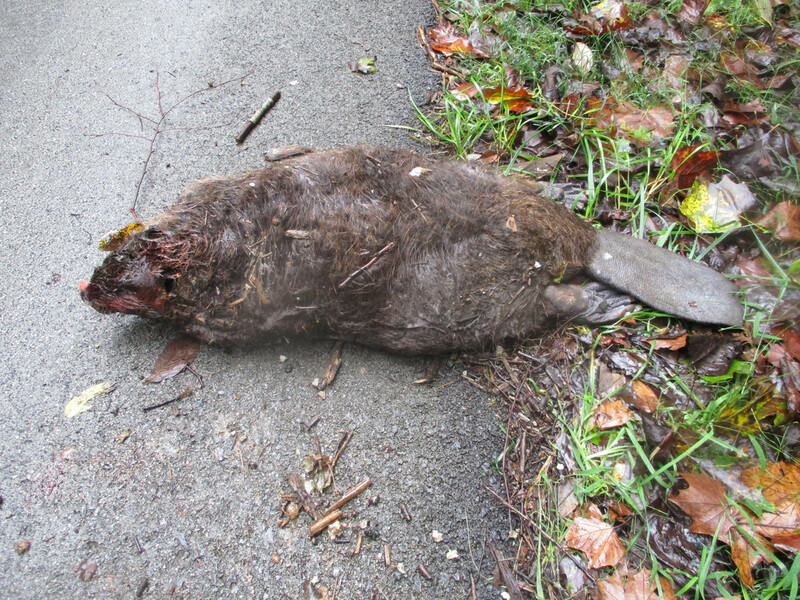 We used to have Beaver around here about 15 years ago but my neighbor didn't like them and had them all trapped out. I had not seen any evidence since...no chewed up trees or dams. He was a big one; at least 25 or 30 pounds. My wife bought me a blind and I have yet to hunt with it. The only hunting I have done from a blind was coyote, and that was on someone else's set up. I am hoping to use it for deer, turkey, and possibly bear. If I hunt on public land, can I just go our pre-dawn and set up my blind and wait? Do animals have to get used to it? Can I just plop it on a ridge and hunt, or do you have to camo them in? Do I have to worry about scent and wind as much? Any help about getting started with a blind would be great. At this point, all I know how to do is put it up. What is the most out of place critter you have ever ran across. Mine would have to be a Wolf in the LP of Michigan near the town of Gladwin. I live in eastern ky been in the woods all my life in ever hollor soon will be 47 years old never seen a rattle snake untill yesterday. I had been getting pictures of this deer for the last few months and Connor had his eye on him. He has hunted every chance that he could since bow season came in. Well, basically the story starts with a case of mistaken identity. I started getting his pics about 2 weeks before the season and almost immediately recognized the shape of his rack as a deer I had pics of for 3 years prior. I’ve got pics of this joker along with his running mate the Wide 10 since May. I’ve worked my tail off running cameras and mineral trying to pin point this joker. And it paid off. Decided yesterday that we were going to dove hunt this morning. My oldest daughter always wants to go with me no matter when I go. My buddy said his son was going and wanted me to ask my boy to go. pics an outfitter friend sent me. these are public land gators in the Okeechobee area, can't use firearms on public land hunts. my son shot a gator with these guys last year on private land using a rifle. Safari Club Official Scorer in Kentucky???? Greetings all. I'm looking for a Safari Club Official Scorer in Kentucky. I live near Shelbyville. I have a Bison mount I'd like scored. Any help would be greatly appreciated.